The infamous city of New Orleans and its wonderful French Quarter, Arts District, Faubourg Marigny, Garden District, Audubon Park and Zoo and St. Charles Avenue are as fabulous as ever. Tens of thousands of visitors come to the "Big Easy" every year and return with great stories and memories. With a diverse cultural background, New Orleans was settled in 1718 by the French near the delta of the Mississippi River. The heavy French influence is still evident, along with the culture of other settlers: the Spanish and the Creole Indians. Everywhere you turn in the downtown area today you will see these cultures still controlling the food, architecture and more. New Orleans became part of the United States with the Louisiana Purchase in 1803. It is known for its fabulous food, great music, cultural diversity and now for surviving one of the worst storms in history. 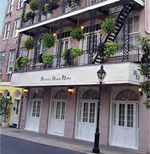 Today one can enjoy Bourbon Street, visit the many museums, take a river boat cruise on the Mississippi, and so much more. For more than 150 years, the biggest event in New Orleans has been the Mardi Gras held each February. You should book early for next year's event. 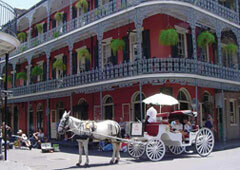 Visit New Orleans this year and savor the history, the culture, the food and enjoy the abundant entertainment options. European ambience and southern hospitality are combined in this charming inn. Tropical courtyard with pool. Dine at the Louisiana Heritage Caf� & School of Cooking. 83 luxurious guest rooms and suites, with coffee maker, hairdryer, newspaper and free use of nearby health facility. Continental breakfast. Walk to shopping, dining, art galleries and sightseeing.